The Eucalyptus weevils, Gonipterus spp. (Coleoptera: Curculionidae), are leaf-feeding beetles native to Australia. There are approximately 20 described species within the genus Gonipterus occurring across the eastern areas of Australia from Northern Tasmania to Queensland, and a small number in southwestern Australia. Also known as the Eucalyptus snout beetle, the weevils are a major defoliator of a range of Eucalyptus species and are considered serious pests in eucalypt growing regions of the world. Adults and larvae feed on newly expanded leaves and shoots of host trees, with the latter causing the most serious damage. Feeding can result in dieback of shoot tips and development of tufts of the epicormic shoots. Serious infestations can lead to defoliation, reduction in tree growth, loss of apical dominance and even tree death. Once considered a single pest species, Gonipterus scutellatus Gyllengal 1883, recent taxonomic and molecular research has determined that it is actually a complex of cryptic species. There are currently ten species that constitute a monophyletic G. scutellatus complex, four of which have now been described – G. balteatus Lea, G. plantensis Marelli, G. pulverulentus Lea and G. scutellatus Gyllenhal (eight species identified based on molecular data and two species based on morphological results) (Mapondera et al. 2012). Establishment of the remaining species within this complex, and others that possibly exist, would explain the phenological differences observed in Gonipterus sp. populations in different countries, including difference in susceptibility of Eucalyptus host species. These weevils have established themselves as important economic pests of Eucalyptus in Africa, America, Europe, New Zealand and southwestern Australia, and have been reported on all continents with the exception of Antarctica (and possibly Asia). Adults are generally brown to dark red-brown weevils, approximately 12 – 14 mm in length. Adults have a smooth dorsal surface, with a light transverse band on the back (elytra) covered in small pale hairs. The rostrum is 15 mm long, prothorax 2.2 mm long, elytra 6.2 mm long and 4.6 mm wide. Whilst there are no current morphological characters that can be used to reliably distinguish between the species within the complex. It is possible in live specimens to identify, with some certainty, G. balteatus, G. platensis, G. pulverulentus, Gonipterus sp. n 1, 2 and 3, based on the pattern on the thorax and elytra formed by the white scales and waxy covering. Morphological identification of the species can be reliably determined by dissection and examination of the male genitalia based on differences in the types of aedeagal sclerites. Female weevils lay eggs in vertical groups of three to eight. The egg is cylindrical, smooth and bright, rounded at each end and approximately 1.25 mm in diameter. The eggs are encased within a grey-brown coloured mass made up of excrement, which attaches the mass to the leaf. Eggs are generally laid on the upper surface of developing shoots and newly expanded and mature leaves. The egg mass is approximately 3 mm long, 2 mm high and 1.5 mm in length. Larvae are between 10 and 14 mm in length. Their colour ranges from yellow to orange, with small black spots on their back and a black stripe running either side of their body. Larvae are legless and covered in a sticky slime that helps them remain attached to the foliage. When feeding, larvae produce a thin thread of excrement that coils up behind them, which is characteristic of all Gonipterus spp. Young larvae and feeding damage on newly expanding foliage. Image: Simon Lawson, USC. Pupation occurs in the soil and leaf litter, lasting around 30 to 40 days. Pupae are a creamy yellow colour, with pale to red-brown eyes. The body is elongated between 7 and 11.3 mm. Despite their taxonomic complexity the biology of Gonipterus spp. are similar. As temperatures warm (early September in Australia) overwintering adults move into the foliage to start feeding and mating. 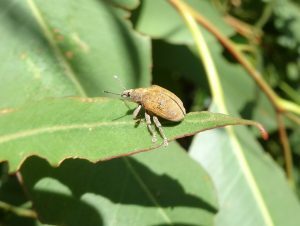 Female eucalypt weevils feed for around one month before laying eggs on young eucalypt leaves. Eggs hatch and larvae emerge around three to four weeks later. 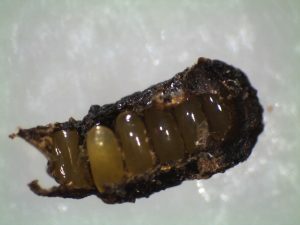 Larvae emerge by chewing through the base of the egg mass where they then feed for five to eight weeks, developing through four instars. Pupation occurs in the soil. The next generation of adults emerge in January and will produce a second generation, which emerge around late March. Newly hatched larvae feed on new leaf tissue and older larvae tend to feed on the leaf edges. An adult female can produce up to 800 eggs throughout their lifetime, with two to three generations per year depending on the climate. Adults overwinter clinging to twigs at the base of leaves or in sheltered areas such as under loose bark on the tree. 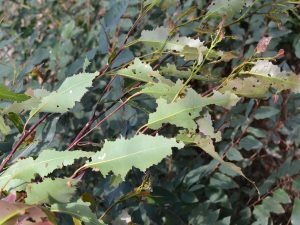 In all areas outside of their native range Eucalyptus weevils cause severe damage to Eucalyptus trees. 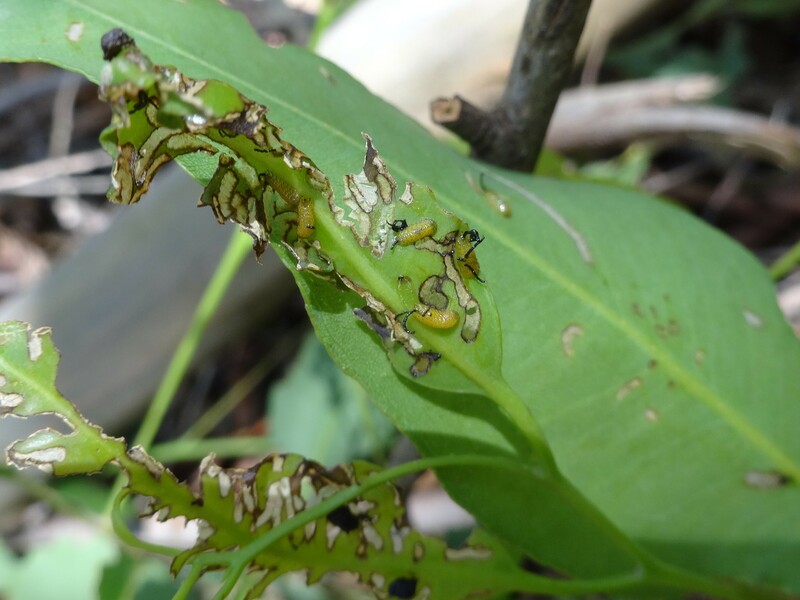 Feeding by both adults and larvae are damaging, however larval feeding is generally regarded to be more serious because their feeding damage coincides with the growth of new foliage. Larvae mine the leaf surface in early instars and consume the lamina in from the leaf edge in later instars, leaving long thin windows, or tracks, that continue to expand as the leaf grows. Growing tips can be completely defoliated and die, causing loss of height and poor tree form. Adults generally feed on the edges of the leaf, leaving ragged or scalloped edges. 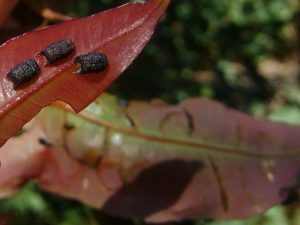 Both adults and larvae feed on the newly developing eucalypt leaves, buds, shoots and mature foliage. Minor feeding damage can result in leaf drop. Newly expanded trees may shrivel and curl, and damaged shoots may expand into deformed leaves. In severe cases the upper crown and foliage may be reduced to leaf mid-veins and twigs. Feeding also weakens trees by defoliation, die-back of shoots and tips and the development of epicormic tufts. Trees develop a stunted and broom-topped appearance if successive defoliation occurs, in young trees this can result in death. Damage occurs from early spring through summer coinciding with peak oviposition periods. The Australian distribution of the complex ranges from north and south-eastern Australia to south-western Australia. Below is a table representing the of areas from which Australian collections have occurred (some areas of Australia have not yet been sampled). Gonipterus platensis appears to be native to Tasmania, Australia. 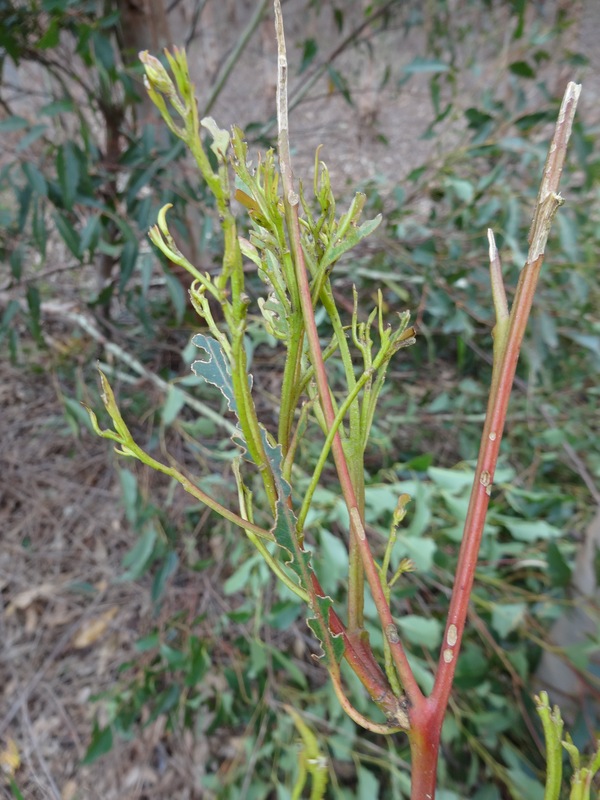 It has now spread throughout E. globulus plantations in south-western Australia. Low genetic diversity of these populations suggests that G. platensis was probably a recent introduction from Tasmania into south-western Australia. Outside of Australia G. platensis is found in New Zealand, Eastern and Western South America, south western North America, Western Europe, the Canary Islands and Hawaii. Gonipterus pulverulentus is native to eastern Australia and has now been found in South America where it was originally misidentified as the gum tree weevil, G. gibberus Boisduval, which does not belong to the G. scutellatus complex and is not present in South America. Gonipterus n. sp. 2 is native to eastern Australia and is likely to have been introduced into south-western Australia by accident in the mid 2000’s. It has been found in Africa, Italy and France. Recent molecular studies of G. scutellatus specimens collected from around the world did not represent G. scutellatus. 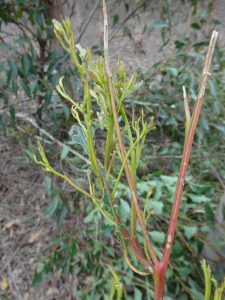 Therefore, this species has not been introduced anywhere else in the world, and has been previously misidentified from 26 countries.This means that the true identity of the various pest populations causing damage to eucalyptus plantations across the globe is unclear. Due to the cryptic nature of the species and confusion as to the identities of the species of the Gonipterus complex, information on their global distribution and the origin and time of introduction has not yet been fully understood. Gonipterus scutellatus appears to be endemic to Tasmania, Australia. The eucalypt weevil has been collected from a wide range of Eucalyptus species, preferring broader leafed trees.The host range and preference of the Eucalyptus weevils will differ across the country and area of introduction, due to species complex. Further research is needed to better understand the difference in host use between these cryptic species. 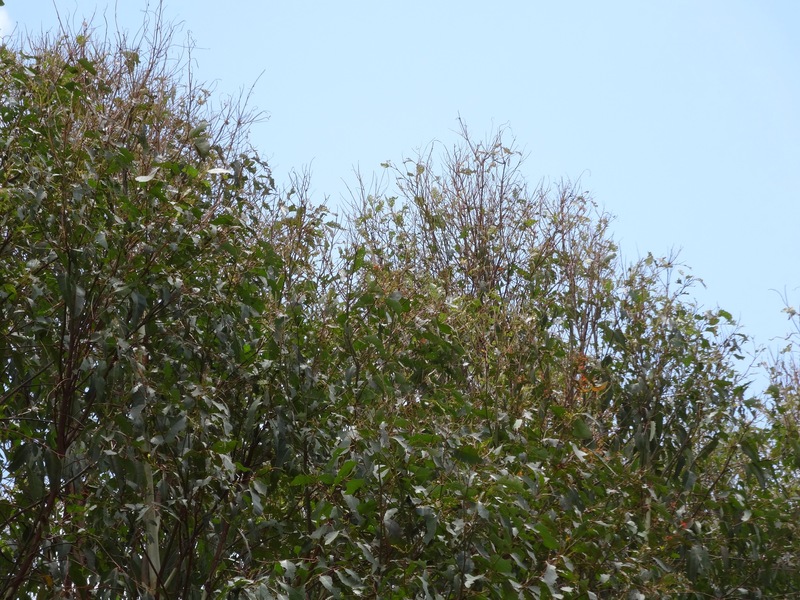 See here for a list of Eucalyptus trees that Gonipterus have been collected from. Biological control of Gonipterus spp. has been successful using the egg parasitoid Anaphes nitens Girault (Hymenoptera: Mymaridae). In the 1950’s A. nitens was introduced into South Africa, from Australia, to control the misidentified Gonipterus scutellatus, now known to be Gonipterus n. sp. 2. The parasitoid successfully established and provided effective control over these pest populations. Anaphes nitens has been successfully released in eastern Africa, Madagascar, Mauritius and St Helena. However on introduction into other eucalypt growing regions across the globe, control of Gonipterus has not proven as effective, likely as a result of mis-matched host and parasitoid. In South Africa, A. nitens is more successful in the low-lying warm areas of the country in comparison to the cool higher areas, which is likely due to the seasonal mismatch between parasitoid and host. This has also been shown in southwest Australian E. globulus plantations, where A. nitens parasitism rates of G. platensis are extremely low at peak oviposition periods in late spring (October/November). Anaphes nitens is endemic to south-eastern Australia and has been reared from Gonipterus n. sp. 2 eggs from Victoria, New South Wales and Queensland. It has also been reared from G. platensis eggs collected from Tasmania. Female A. nitens typically lay 20 – 100 eggs, developing from egg to adult across a two to four week period (temperature dependant). There is a need for further research into the Gonipterus spp. – Anaphes spp. host relationship to provide better host-parasitoid matching across the different eucalypt growing regions of the world. Other biological control agents include parasitoids Anagonia scutellata and Euderus viridis (South Africa), egg parasitoids A. inexpectatus and A. tasmaniae, larval parasitoids Apanteles spp., Proctotrupes spp and Entedon magnificus. The larvae of G. platensis are also parasitised by two undescribed species of tachinid flies. Chemical control can be effective, but requires regular monitoring of development of Gonipterus populations in plantations. Spraying should only be conducted with registered insecticides that are approved for use by Government agencies and certification bodies such as the Forest Stewardship Council (FSC), and only if an economic threshold of egg/early stage larval populations are exceeded. Since most defoliation is caused by later instar larvae, sprays should be targeted at early instar larvae to prevent damage. In general, however, use of chemicals is not recommended due to the potential danger to beneficial insects, and other non-target animals such as bees, which are attracted to the flowers of eucalypt species. Certification agencies such as FSC are continually limiting the number of chemicals available for use in certified plantations, further emphasising the need for research into Gonipterus spp. globally and host/parasitoid biotope matching for more effective biological control of the Eucalyptus weevil.